I am on school holidays at the moment, and how should holidays begin? With fishing of course! So last Saturday I headed off for a solo run to work some Threadybusters around the creek mouthes. 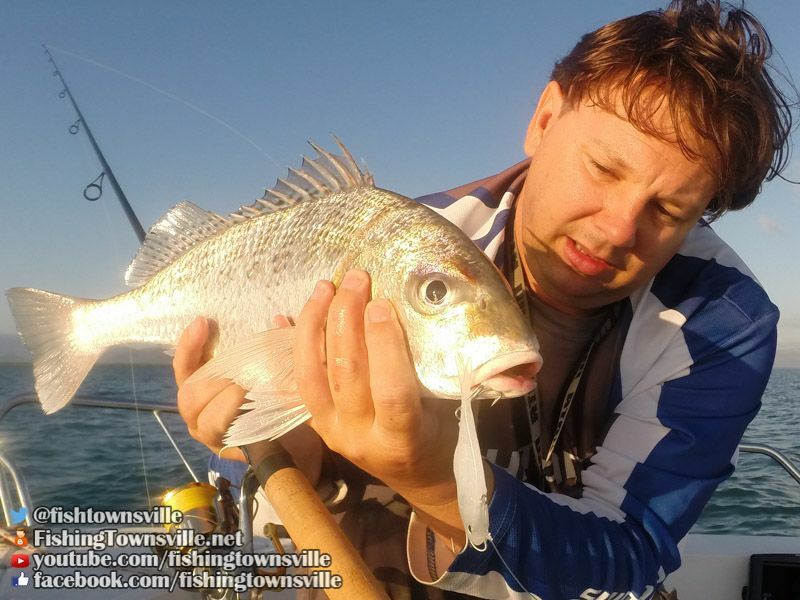 Andrew was off fishing,and ultimately winning, the Hinchinbrook Barra Comp and the family had other plans. So I was on my own for the morning. It was very quiet overall, with just about everything that could go wrong going wrong. But I managed to play around with a few small Trevalley and Queenfish that found the Threadybuster offering too good to refuse. And eventually persistence paid off when a nice 50cm Grunter took the lure. It really helps to spice up the Thready with a little S-factor when targeting Grunter. It was a beautiful morning on the water, with a flat our run home just before lunchtime in glass condition. One Grunter is not enough to feed our family any more, so I took the sides off and cook up some fresh fish and chips for lunch. Spectacular eating, less than 2 hours from water to plate!